Adding and Changing Listing Photos. Listing photos are very important to the marketing of your listings. This guide explains how to upload photos into the Paragon 5 MLS. “Tips and tricks” for listing photos along with how to resize any photo are found at the end of this guide. There are several places in Paragon’s Listing Input and Listing Maintenance module where you can maintain your listing photos. Note: While the access point may be different, the tool is the same once you are inside the Photo Administration tool. Click Listings on the Banner Menu and under Maintain click Partials. The following screen displays. Click Select an Action and click Picture Administration. Using the left navigation pane, click Pictures for the Picture Administration tool. Using the Listing Wizard, Click Next for the Picture Administration tool. Click Listings on the Banner Menu and under Maintain click Listings. The following page will display. Choose how to search for the listing to receive listing images, as seen in the screenshot above. Using the filter tool on the right side of the page, click the drop down box and select the appropriate listing ownership classification. With your listing displayed, click Select an Action. The modal below displays. Click Picture Administration to add/edit listing images. While looking at your listing in a custom view etc., left click on a listing image to enter Photo Administration. Step 1: Select Picture Administration (see previous screenshot). The Picture Administration modal opens. Step 2: Click Upload. The Upload Picture modal opens. Step 3: Click Browse to search for the specific picture you want to upload on your computer or camera. Step 4: With the picture name displayed in the blue box beneath Listing Photo, click Upload. The picture is added to your listing. Repeat steps two, three and four as many times as needed until you have uploaded your pictures into the available picture placeholders. Note: To use the Bulk Upload Paragon functionality, you must have Flash installed on your computer. Step 1: Click Upload Photo(s) to open the upload tool. Step 2: Click Browse to locate the photos to upload. When all of the photos are in the list in the middle of the tool. Step 3: Click Upload to add the photos to the Picture Administration tool. Note: The Bulk Photo Upload tool is similar to the One-at-a-time Photo Upload tool. The difference is the list of pictures found in the box in the middle of the tool. Picture Rearranging tool allows you to change the sequence of the pictures in your listing once you have them uploaded. Step 1: Left click and hold on the picture you want to change. Step 2: Move the picture to the place you want it to appear and release your mouse button. The other pictures will move to make room for your relocated picture. Step 3: Click Save to retain the new picture arrangement. Note: You can use this function when you initially upload pictures or when you want to update/change a specific picture in your listing. Upload Help has a lot of good information about pictures inside Paragon. Click Upload Help. A modal will open. Below the modal screenshot is the text contained in the modal and an active link to get the picture-resizing tool. Photo Compression: If a photo is over 125K in file size, the image will be compressed to 125K. Note: this could result in a reduction in quality. For users who upload photos larger than the 125K limit, it is recommended that the images do not exceed 10MB in file size. Image Size: Image size refers to the resolution of the photo. Paragon requires a resolution of 1280 x 960 or less. If a photo is under the 125K limit but has a resolution of image size larger than 1280 x 960, compression will occur. In MS Windows, the image size of a photo can be accessed by mousing over the image—details will display in a pop up. 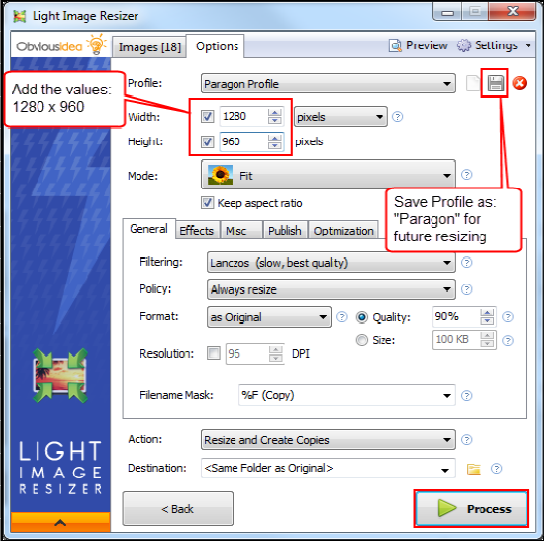 Image Resizing Tools: There are several free tools available for resizing images. For a list of recommended easy-to-use tools, click here. Acceptable Formats: Only .jpeg .gif and .png image formats can be uploaded to Paragon. File Name Special Characters: Special characters, such as \/:*? "<>| etc., cannot be used in the photo file name. Image Resizing Tools: when you click the link for the resizing tool, you will be taken to the following Black Knight (Paragon) web page. The image resizing tool was created by Microsoft for their operating systems. Find your operating system and click Download. Follow the instructions in the wizard to download and install this tool. Because many digital cameras take pictures that are too large for Paragon, you can easily resize your pictures before uploading them to Paragon. Step 1: Browse to the location on your computer or camera of your pictures. Step 2: Select the pictures you want to resize. After left clicking your first picture, hold your control key as you left click the other images you want to resize. Step 3: Right click on one of the images. Make sure you keep the other images selected. Click Light Image Resizer. A window will open up. Step 4: A modal opens and counts from 20 to 0 in approximately 10 seconds. Click Continue to open the tool to select the new size of your pictures. Select the picture profile 1280 x 960. If that option is not available to you, manually enter the dimensions in the fields that say Width and Height. Enter a profile name so you can choose the 1280 x 960 in the Profile dropdown list in the future. Click the Save button to save your Paragon picture profile. With 1280 x 960 in the Width and Height fields, click Process in the bottom right hand corner of the modal to resize your pictures. The resizing tool copies the selected pictures, resizes them, saves the pictures with the same picture name with “(small)” added to the end of the picture name. Upload the pictures with (small) in their name into Paragon. Use a camera that takes good pictures. Preview the pictures before you upload them into Paragon. Review the pictures after you have uploaded them into Paragon to make sure they are a good representation of your listing. Stage your pictures – just as you stage your properties for tours and open houses, stage your photos. Your listing photos are what most people will see before they visit the property. Make sure the “internet” curb appeal grabs the prospects attention. Don’t face into bright lights when you take your listing pictures. The bright light (i.e. the sun, even through a window) will cause the subject of your picture (the house/room) to be in a dark silhouette and details will not be seen clearly. Take landscape pictures so the pictures fit the Paragon picture placeholders. If you turn your camera on end to take the hallway picture, that picture will be short and skinny and not fill the picture placeholder properly. The picture should be wider than it is tall to fit the Paragon picture placeholder. Note: Avoid your For Sale sign. Most MLSs, boards and associations have rules about branding information in listing images.